Istanbul Design Biennial: Rotterdam design studio Minale-Maeda has devised a set of 3D printed plastic connectors that combine with standard wooden parts so that anyone can make these four items of furniture. 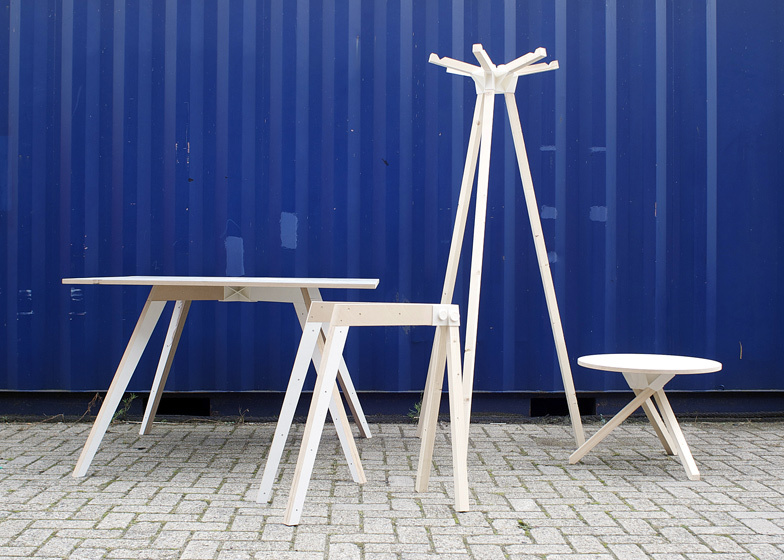 Building on the Inside-Out Furniture project presented at last year's Dutch Design Week, the Keystones collection is intended to be printed at a local manufacturing centre and assembled by the user with no need for joinery skills or instruction booklets. Schematic drawings are etched on the surfaces of the plastic, providing instructions on how to build the side table, dining table, coat stand and trestle. Although the project was self-initiated, the designers set down strict rules about what the final product could include. "There should be a single connector with no additional fasteners and no screws," they told Dezeen. "The other guideline was that it should be as compact as possible while being as strong as possible, since the material is comparatively weak," they added. The wood is clamped into the 3D printed connector in a way that relieves stress from the connectors themselves. End users can either follow the drawings and use the same size pieces, or customise the data files to alter measurements and insert elements of their own design. "The sizes of the connectors were chosen to fit with commonly available materials that can be glued on top of each other to achieve the thickness desired for strength," they explained. "The clamping screw provides a tolerance to catch any slack." Minale-Maeda was founded in 2006 by former Design Academy Eindhoven students Kuniko Maeda and Mario Minale. Keystone was presented at the Istanbul Design Biennial, which continues until 12th December. We recently featured another 3D printing project presented at the biennial which explored how digitally produced objects can be as individual as handmade ones. The work of Studio Minale-Maeda investigates the potentials of multi-directional material translations (digital to analogue to building-block construction), open-source schematics (from Gerrit Rietveld drawings to the online Lego community), and novel forms of distribution (such as downloadable design). Keystones reduce the design of a piece of furniture to a single connector – a compact piece that can be 3D printed on-location. The keystone holds together the various components of a table or chair, which can be fabricated using basic workshop tools or a 2D CNC router, without the need for joinery skills. With Keystones, only the most essential part of the furniture needs to be shipped; the rest can be made from the materials at hand. 3D printers could "print ammunition for an army"